Weymann & Son Keystone State Parlor Guitar c. 1906 | Weymann and Son was a Philadelphia instrument maker and seller from about 1894 through 1930. Their instruments rivaled those of Martin in both workmanship and quality of materials. This example dates to about 1906. Weymann’s very early guitars did not have serial numbers, and they started adding them about 1900. Sometime around 1910 they also added style numbers. This instrument has a serial number but lacks a style number. 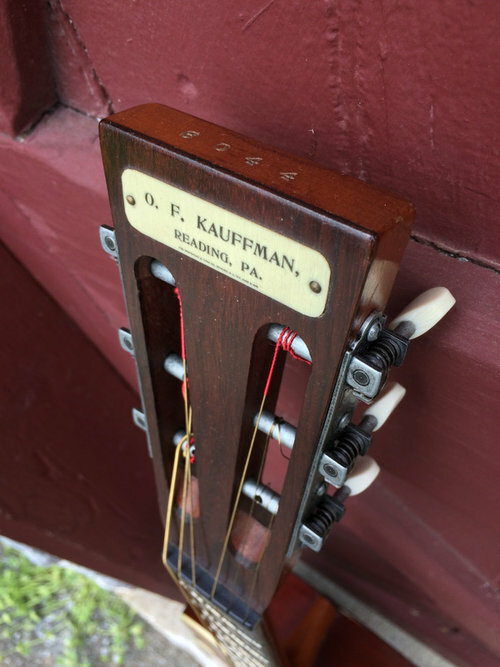 And the fact that the O. F. Kauffman company (seen on the headstock label) was essentially gone by 1907, we can see this guitar fits nicely into the 1906 time period. This guitar is larger than the standard sized guitar of the era. 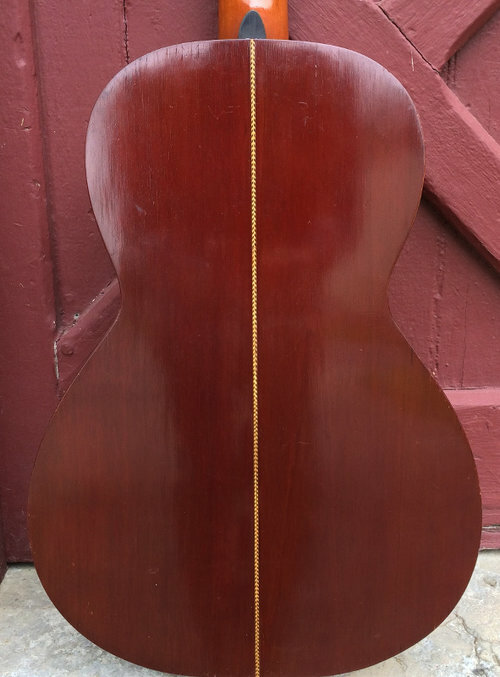 This would have been called Grand Concert size and has similar measurements to a Martin 12-fret ‘O’ guitar. The lower bout measures 13 3/4", with a 25 1/4" scale. 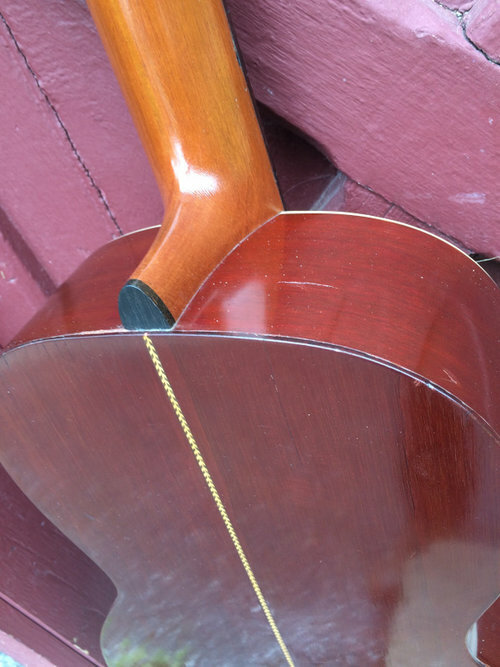 The fingerboard is 1 13/16" across at the nut, and string spacing is 2 1/4" across at the saddle. The neck is carved to a soft 'V', very comfortable with a modern feel. The back and sides are a high grade Cuban mahogany and the top is Adirondack spruce. The fingerboard is an even-grained Brazilian rosewood. The neck appears to be cedar. There is a celluloid tag affixed to the head stock which reads "O.F. Kauffman Reading, PA". 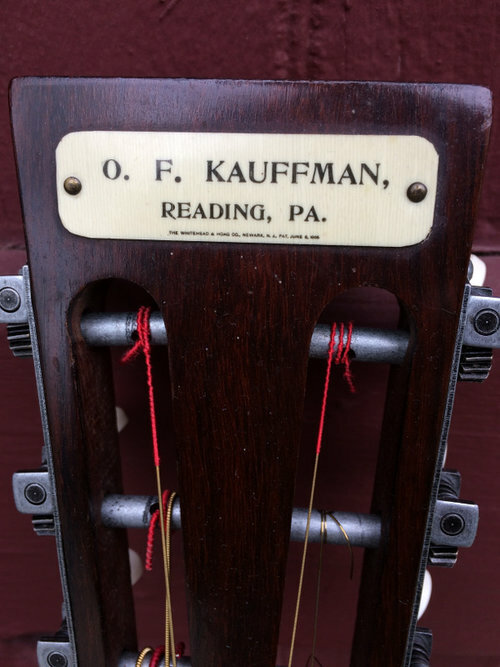 Oliver F. Kauffman was a piano store owner in Reading and the likely seller of this instrument. A gold Weymann & Son Keystone State decal is affixed to the back of the head stock. The top is bound in b/w/b purfling and white celluloid. Black, white and red purfling adorn the sound hole, and there is a tasteful herring bone strip inlaid down the back center seam. The condition of the guitar is almost flawless, but for a few nicks from wear, and a 1" crack on the (bass) side near where the neck joins...from an apparent bump. The guitar has had some modifications. The original ladder bracing was expertly converted to X-bracing, a replacement bridge (Brazilian flat pyramid to match the original) and replacement tuners added (originals in case). 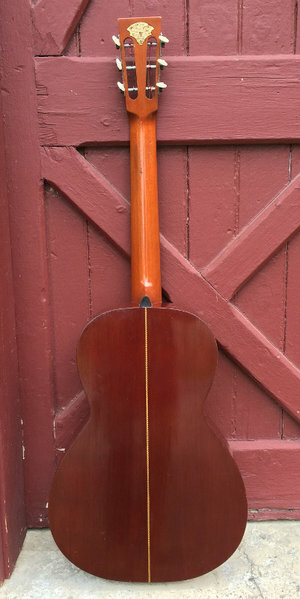 A non-adjustable truss rod was installed for neck stiffness. The rare and well made guitar is perfectly set up. It plays effortlessly and produces a most lovely tone which would be appreciated by any finger style guitar player. Check out the you tube video.